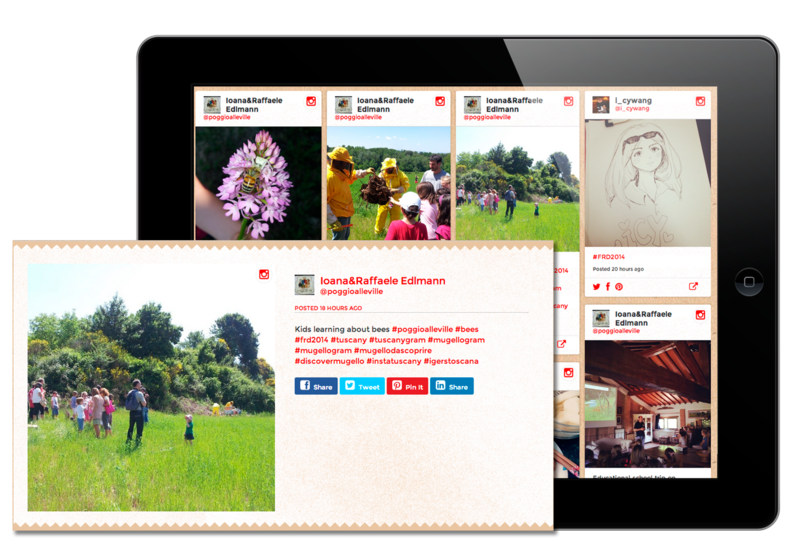 Take Control of Your Brand's Social Media Story by harnessing the power of TwineSocial. End network fragmentation. Include your entire brand story—from all your networks—on your hub. Drive more engagement with your content. All thanks to integrated sharing and immersive design. 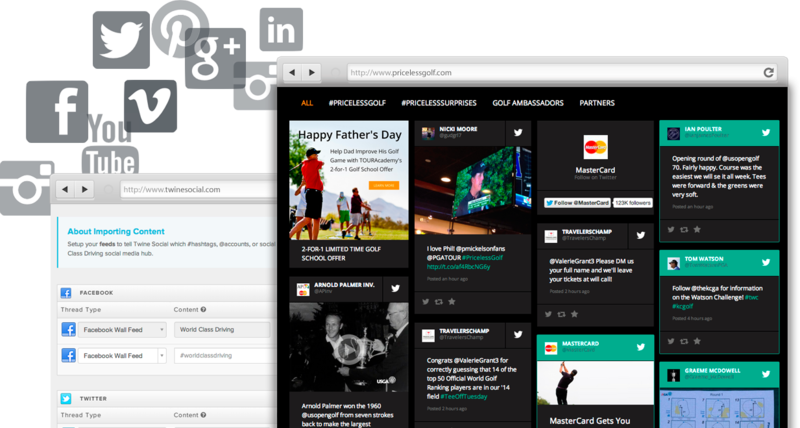 Match your hub to your brand with custom CSS integration + seamless installation on your website. Sell or share anything. With Promotions you meet your audience where they are: On your hub. 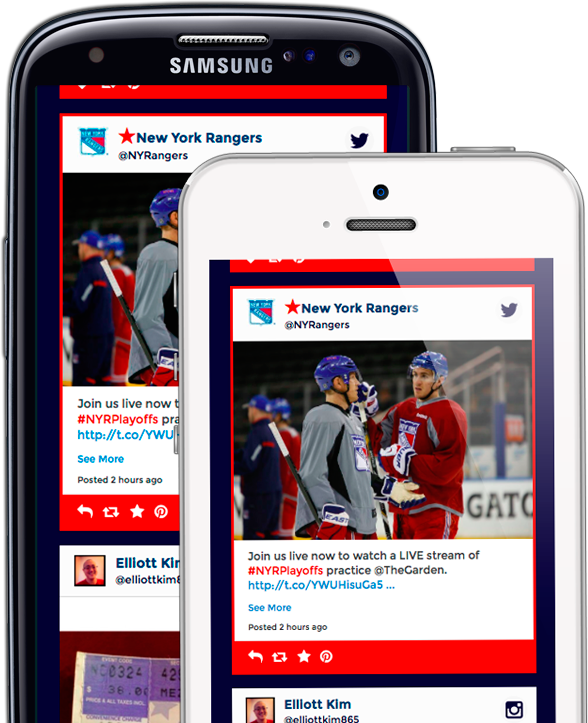 Responsive designs look brilliant on mobile, web, TV, and broadcast with customizable layouts. Discover new things about your audience, your content, and your hub with integrated metrics. Thanks to infinite scrolling and immersive design, your TwineSocial hub turns casual brand interactions into far longer brand experiences. Now your amazing content isn’t an interruption in a stream of selfies and cat pics—it’s a full-blown digital destination. Dont send your hard-won visitors back to the social media networks to dig into your posts. 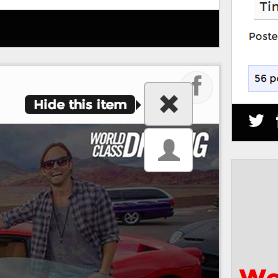 With TwineSocial they simply click any tile to display a rich detail panel right inside your hub. 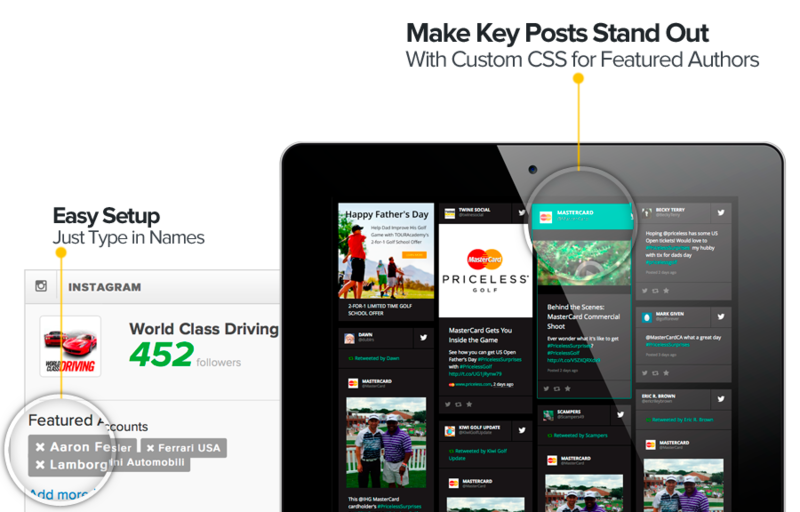 Here visitors can watch videos and view larger images without leaving your site. And they can share posts they like on any major network with just one click. Sprinkle Follow Tiles throughout your feed inviting your viewers to follow your connected social media accounts. It’s how your hub helps drive social media engagement with your visitors long after they’ve left your hub. All posts on your hub are created equal, but some posts—maybe posts from your official accounts or brand ambassadors—are more equal than others. Highlight these posters as “Featured Authors,” so they’ll get more attention—and more shares. 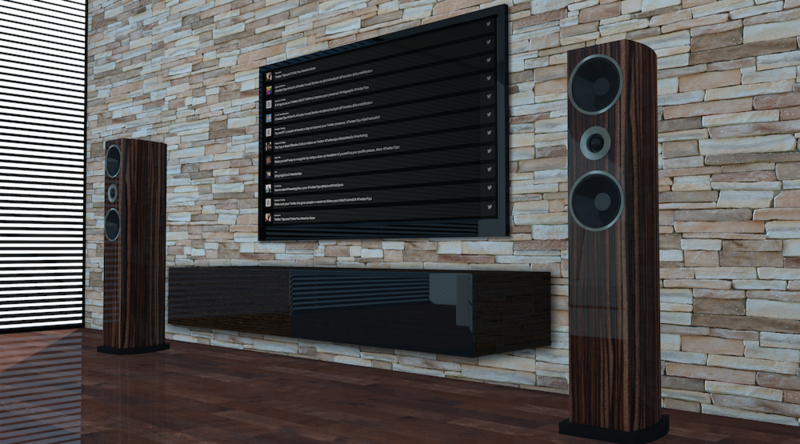 In today’s connected world, your social hub needs to look amazing in any venue. 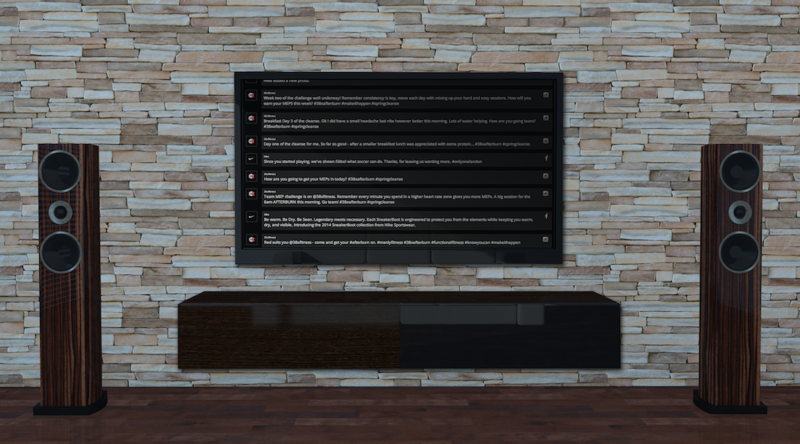 HDMI broadcast your social hub to any TV, monitor, or projector. 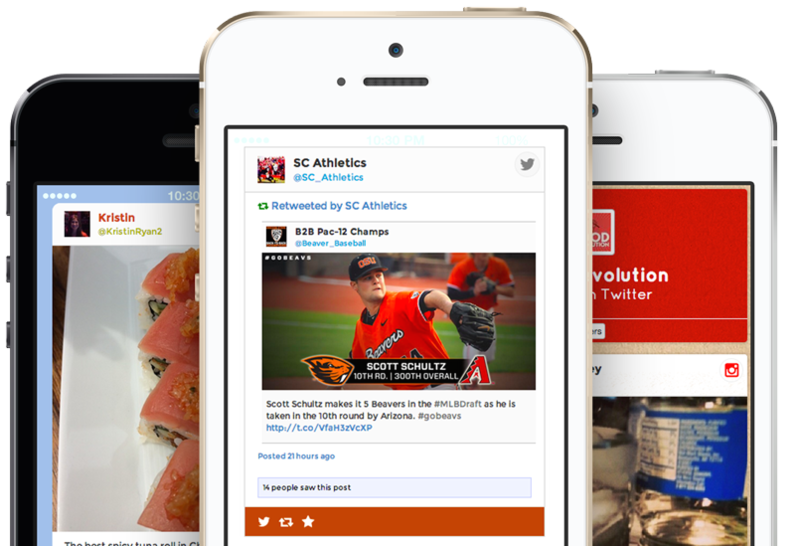 With support for 12 of the most popular social media networks with every plan, display your entire brand story: posts from Facebook, Twitter, Google+, FourSquare, Pinterest, Vine—even blogs with RSS. 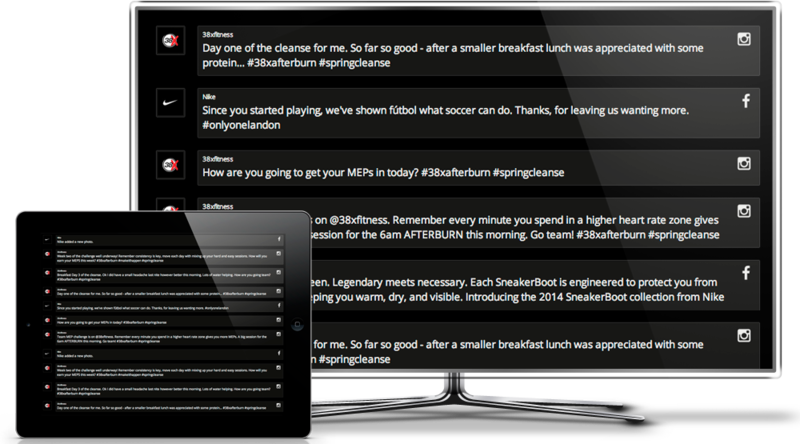 And you can have Twine pull in user-generated content based on #hashtag, too. 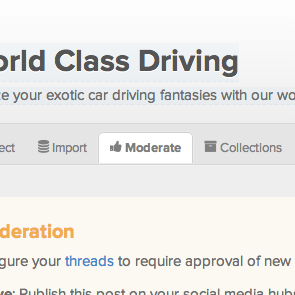 Display only the posts you want to with Twine’s four levels of moderation. Route content to approvals. 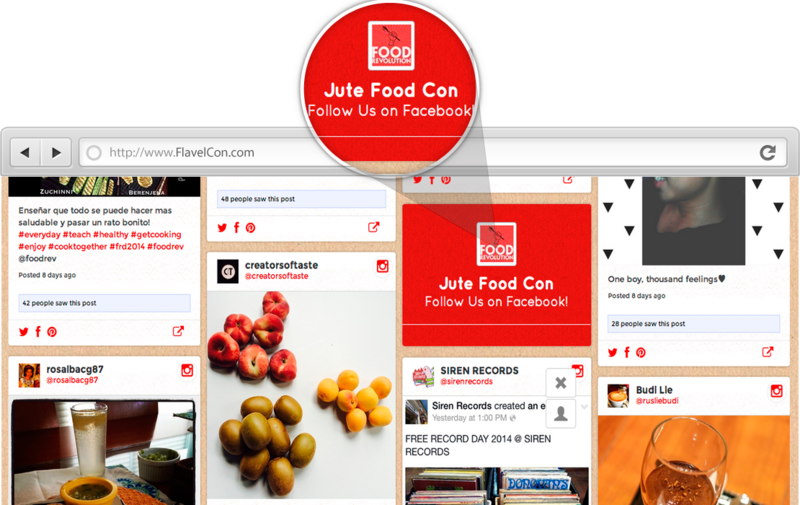 Great for user generated-content from brand hashtags. Approve or reject each new post with just one click. 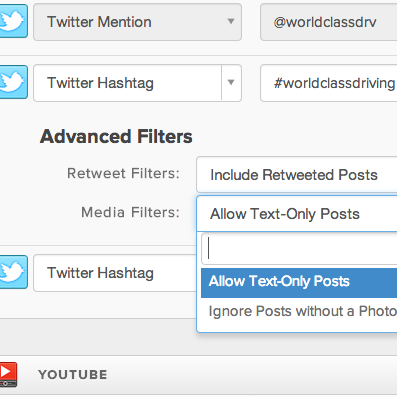 Use filtering to easily weed-out offensive or unrelated content based on common words or hashtags. 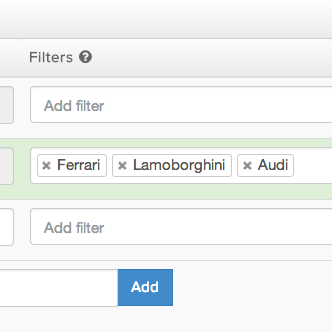 Filter by media type. When you want to make your hub more visual, choose only to display posts that include an image or video. Moderate out any post directly from your feed. And you can mute users to remove all their past or future posts. Segment your hub by topic with Twine’s curation options. Tell Twine what criteria you’d like to segment by and Twine instantly creates your new collection. From the bottom up we built Twine to put your brand front-and-center—not ours and not the networks. Take sharing: When someone shares a post on your social hub, they don’t share out a link to the original post on the network it was first posted. Instead, Twine smartly includes a link back to the post on your social hub, where new visitors can experience your entire story. 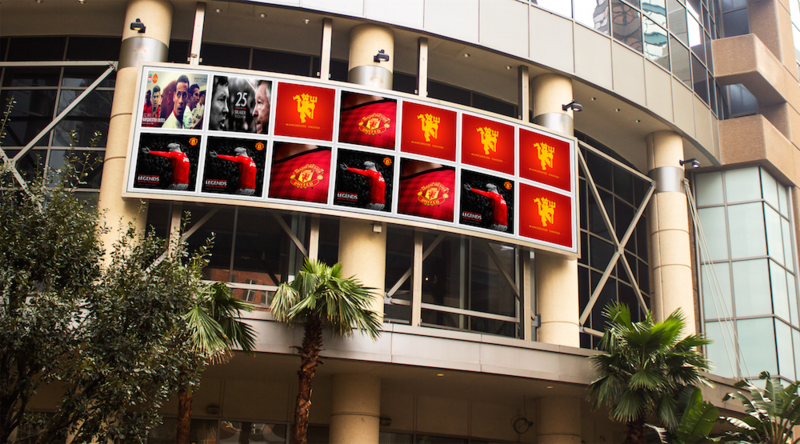 Once youve driven your fans to your hub, you need a way for your brand to promote something right inside social hub. Like related product, events, or coupons. That’s where Promotions comes in. 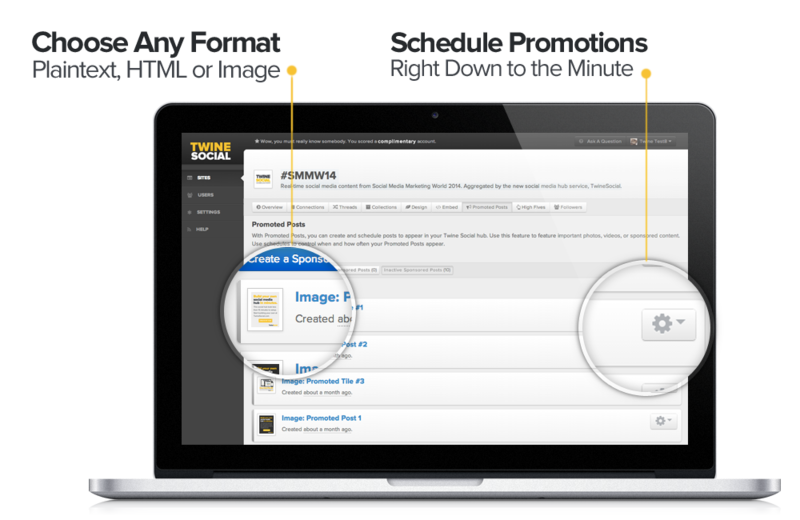 It’s a powerful way to easily promote anything to your visitors. With a few clicks, set a Promotion to occur throughout your hub. Or feature a Promotion on the top of your feed to make sure your audience sees it. Promotions comes with scheduling, so you can set when each Promotion appears (and disappears), right down to the minute—so theyll only display during a sale or other event. Plus, Twine’s analysis will tell you how your Promotions are doing. Or you can connect your promotions to your Google Analytics account to include in your marketing reports. When youre ready to publish your hub to the world, so is Twine. And its super easy. 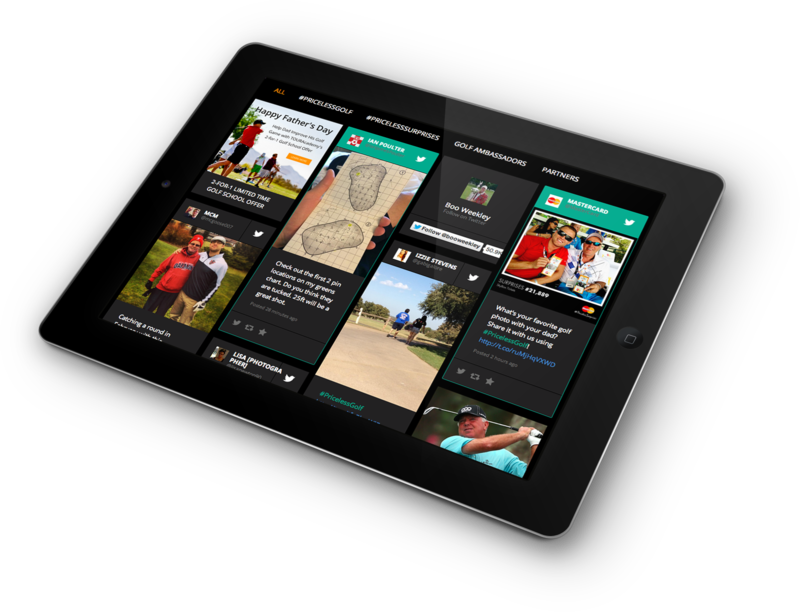 Share your hub at a link hosted by TwineSocial. 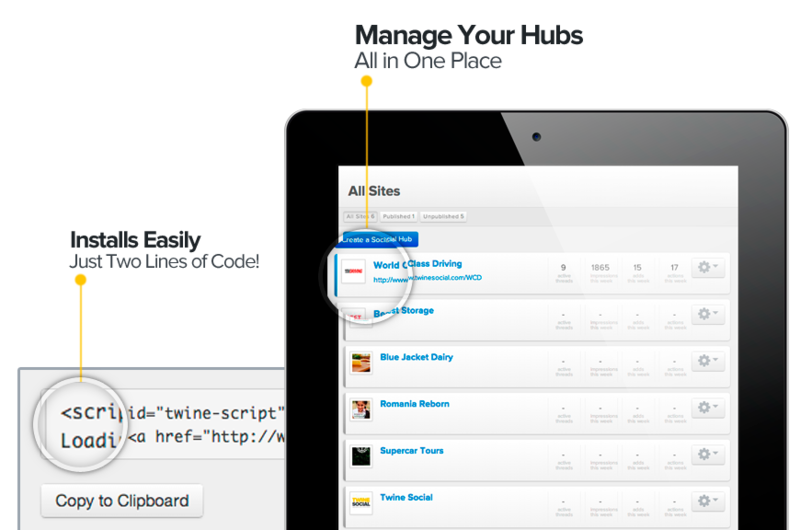 Or embed your hub anywhere on your site, just by copy/pasting one line of code wherever you want the magic to happen. 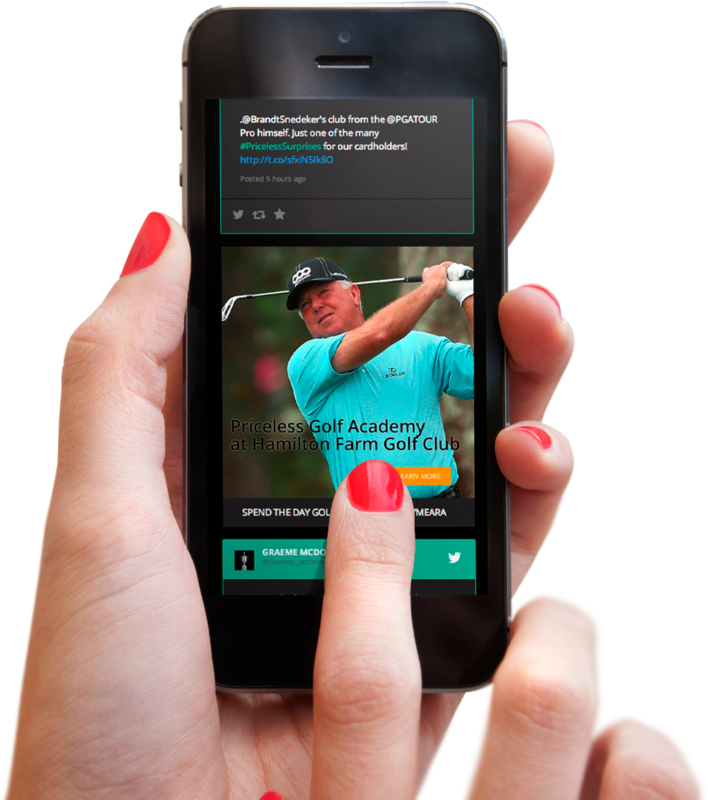 In today’s mobile world, your social hub needs to look amazing on any device. Because every TwineSocial page is built on the completely responsive framework, hubs smartly rescale and rearrange to fit any device: smart phones, tablets, desktops, laptops—if it has a screen, Twine can swing it. Twine also comes with 5 mobile-responsive layouts. Choose the layout that works best for your content: like our large two-column layout for visual content or perhaps our four-column layout for a live hashtag campaign where you need to display as many posts as possible.